Have you found yourself having to ask people to repeat themselves, asking “what” a lot and having to turn the TV up louder while others complain about the volume? Hearing loss often happens so gradually that people may not realize they are dealing with it. Even if you haven’t notice yet, most likely your friends and loved ones have. Communication is a two-way street and it’s important to listen to your friends and loved ones about their experiences with your hearing loss. The longer you wait to get hearing aids, the worse your hearing is going to get. Unfortunately, many people don’t realize how much their hearing loss is impacting them. Hearing loss can develop slowly and over time. 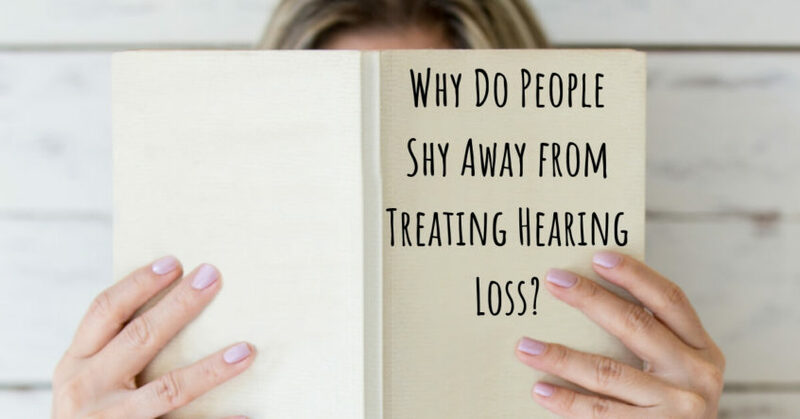 Often, hearing loss is so gradual people don’t realize how much it has deteriorated until their ability to recognize speech starts interfering with their daily lives. During that time, you might miss out on a lot of what’s happening around you. You can miss out on a lot of important details in conversation with friends or family causing you too feel confused and frustrated and ultimately lose the confidence you had in earlier days. This often leads people to self-isolate and become depressed. Studies have linked hearing loss to lower income in the workforce and even dementia. Why Do People Delay Treating Hearing Loss? The reasons to get your hearing checked are undeniable when you think about the risks yet many people still delay. It takes the average person with hearing loss 5 to 7 years before seeking a qualified professional diagnosis, despite the reality that the warning signs of hearing loss are undeniable to others. Are those with hearing loss just too stubborn to get help? Unfortunately hearing loss is predominately subjective: it cannot be diagnosed by visual evaluation and it normally is not accompanied by any immediate pain or discomfort. General practitioners often forget to properly screen for a hearing loss. If individuals with hearing loss do not recognize a problem, chiefly because of the reasons above, then they most likely won’t take action. The only way to properly diagnose hearing loss is through audiometry, which will quantify the precise decibel level hearing loss at many sound frequencies. For many older people that stigma, or diminishing of perceived value, comes in the form of hearing loss. Unfortunately, stigma is also a major impediment to seeking treatment. Many seniors believe if they admit their hearing loss, and subsequently agree to hearing aids, that they will look weak or helpless. There is no question that our culture worships youth. So, is it any wonder that older people with hearing loss are hesitant to admit it, let alone seek hearing aids? The thing is that if many seniors suffering from hearing loss would just seek treatment and start wearing hearing aids regularly the enhancement to their hearing usually restores hearing ability to a level associated with youth. Not only that, but hearing aids have become incredibly innovative, and have become both high-tech and fashionable. While hearing aids are a big investment, they are a very important one. It’s important to ask, what’s the price you would pay for deciding against purchasing hearing aids, as opposed to what you what would truly benefit from purchasing them?” When you consider the break down in your most important relationships, lower earning power and the health risks associated with hearing loss, suddenly the cost of hearing aids can seem minuscule. In likelihood, it will likely end up costing more if you decide not to get hearing aids. Many hearing healthcare professionals will work with individuals to set up a price plan to make these easier to afford. Overall, hearing aids can be life changing and studies show they are worth the investment. Getting checked regularly can help you discover and correct any hearing loss that you might be experiencing so you don’t miss out on life. Contact us at Hearing Aid Associates to further investigate your options when considering hearing aids.